Saloon style comfort in a 4×4 enabling you to enjoy both city and country driving. The Toyota Land Cruiser has evolved over the past 60 years to become the ultimate workhorse. This is a 4×4 that can actually handle off-road motoring. Available in 3 trim levels from Active to Invincible you can have the desired interior you wish. You get 1 engine choice, the Diesel 2.8 litres however you can choose manual or automatic. You can expect fuel return of about 39.2mpg. Acceleration for a 4×4 this size is sprightly with 0-62mph reached in 12.1 seconds. The interior is robust and as tough as the exterior with a busy dashboard full of all the instruments you would need. 5 adults can easily travel in comfort however you can seat 2 extra people in the back should you wish to do so. Cruise control, air conditioning and a rear view camera all come as standard. Seven airbags and stability control help to keep all occupants safe. The elevated driving position offers great driving views all round and combined with light steering you won’t feel you’re in a big 4×4. With a reputation as a workhorse and offering uncompromised ability the Toyota Land Cruiser is the big 4×4 however the price needn’t be big also. 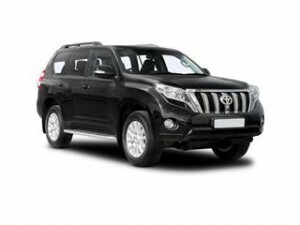 Coast2Coast Cars network of dealers includes stockists of Land Cruisers new and used. Using our simple online form to build the car of your choice allows us to then locate the exact spec. Often we the dealers have special offers so we can save you £1,000’s. Toyota Land Cruiser finance can be arranged if required and at no point during the process is there any obligation to go ahead with the purchase, our service is totally free.